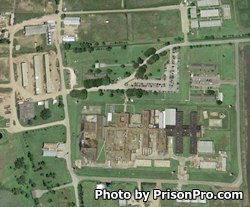 Darrington Unit is a maximum security prison located in Rosharon Texas, part of Brazoria County. Although it is designated a maximum security prison, the facility houses a range of custody levels from G1 minimum custody to G5 maximum, segregation and temporary transient offenders. This is one of the older facilities in Texas and originally opened in 1933, it has since undergone multiple renovations and additions and can currently house up to 1,610 inmates in the main compound and an additional 321 inmates in the Trusty Camp. Inmates are secured by multiple razor wire fences, armed guard towers, electronic detection systems, and a 12 foot high catwalk. The catwalk was used in the 1980's to easily and quickly shoot inmates who became violent or attempted to escape during a time when the prison had a large influx of prison gangs. Today the Darrington Unit conducts agricultural operations which raise cattle, poultry for egg laying, and grows crops on the 6,770 acres of land. This facility is also responsible for the operation of a tire retreading facility which employs selected inmates. All offenders can receive medical, dental, and mental health services while incarcerated at Darrington Unit, and can also receive substance abuse treatment. Inmates are provided vocational classes in heating ventilation and air conditioning, and automotive repair. Academic courses are offered to teach inmates to read, and to allow them to earn an adult basic education and GED. Visitation at the Darrington Unit occurs on Saturdays and Sundays from 7am-5pm. Visits are two hours in duration unless you are traveling over 300 miles in which case you can request a special visit which can be up to four hours in duration. The address on your ID (driver's license) must match the address the offender has provided to the facility.